Theresa May declared last night she believes in the Brexit divorce deal with her “head and heart” as cabinet signed off on the near 600-page plans after an historic five-hour emergency meeting. The prime minister, who will address the Commons today, was heckled by loud protesters as she unveiled senior ministers’ decision that the UK Government should accept the draft withdrawal agreement and outline political declaration. She insisted the “decisive step” was in the “best interests of our entire UK”, stressing the choice was between it, no deal and no Brexit at all. Her remarks came as all 13 Scottish Conservative MPs – led by David Mundell – warned they cannot support a deal that fails to restore “complete control and full sovereignty” over UK fishing waters. Meanwhile Mrs May was also under pressure from SNP MPs, who asked if there was a deal to protect the economy in Northern Ireland, then why not the same for Scotland, which overwhelmingly voted to remain in 2016. First Minister Nicola Sturgeon said it was obvious the prime minister could “barely unite” her cabinet, adding: “In these circumstances it is more important than ever that we are not faced with a false choice between a bad deal and no deal. And she insisted that if the deal is thrown out by parliament, the UK Government “must return to the negotiating table to secure a better one”. Cabinet sign-off clears the way for a special Brexit summit in Brussels – probably on November 25 – for EU leaders to approve the deal, followed by a crucial Commons vote in which MPs will hold Britain’s future in their hands. After a day of furious speculation and amid a growing sense Mrs May will struggle to get her deal through parliament, the embattled leader took to the steps of Downing Street to update the nation. She said cabinet’s decision – taken as EU 27 ambassadors also met to discuss the deal – had been reached after “long, detailed and impassioned debate” and “thousands of hours of negotiation” and meetings. She said she firmly believed the draft deal represents the “best that could be negotiated”, but noted difficult choices had to be made, particularly in relation to the backstop aimed at preventing a hard border on the island of Ireland. She added: “The collective decision of cabinet was that the government should agree the draft withdrawal agreement and the outline political declaration. “This is a decisive step that enables us to move on and finalise the deal in the days ahead. “These decisions were not taken lightly but I believe it is a decision that is firmly in the national interest. “When you strip away the detail, the choice before us is clear. “This deal which delivers on the vote of the referendum, which brings back control of our money, laws and borders, ends free movement, protects jobs, security and our Union. 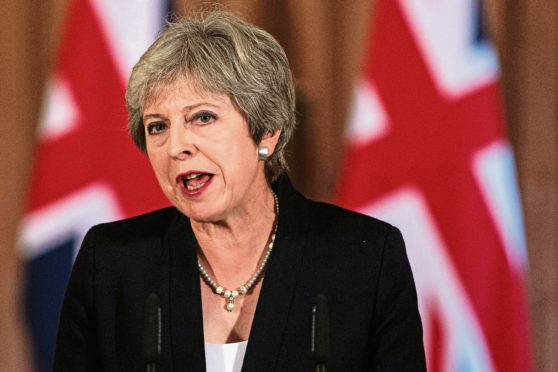 But she stressed: “The choice was this deal which enables us to take back control and to build a brighter future for our country or going back to square one with more division, more uncertainty and a failure to deliver on the referendum. “It’s my job as prime minister to explain the decisions the government has taken and I stand ready to do that beginning tomorrow with a statement in parliament. In a letter to Conservative MPs, European Research Group chairman Jacob Rees-Mogg said they should not support the deal. “The proposed agreement will see the UK hand over £39billion to the EU for little or nothing in return,” he warned. The deal is “unacceptable to unionists”, will “lock us into an EU customs union and EU laws” and is “profoundly undemocratic”.